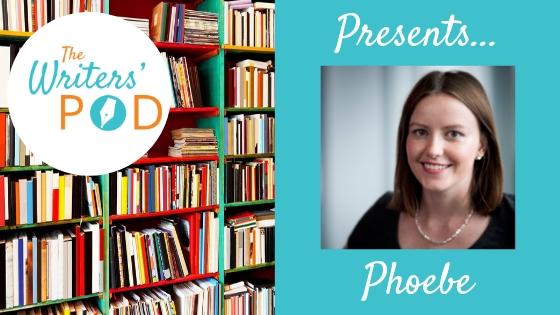 The Writers’ Pod Presents… Phoebe on publishing, writing and books. I feel very fortunate to have met and interviewed Phoebe Morgan, author of The Doll House (which I loved), The Girl Next Door, (just published and saved for my Easter holiday reading – I can’t wait!) and Editorial Director at Orion imprint, Trapeze. Her passion for books threads through everything she does and her genuine desire to support other authors and her generosity of spirit are extremely refreshing. Her answers to my questions reflect all of the above and are full of sound advice for writers at all stages of their careers. You are an editor, an author and until recently the outgoing co-chair of the Society of Young Publishers (SYP), how on earth do you juggle your professional responsibilities? I think it helps that I genuinely really enjoy all of them; I love the publishing industry and feel very lucky to be part of it, so for me it doesn’t feel like awful hard work, it just feels like working on things I’m passionate about. I try to respond to things as they come in, to stop me forgetting, and usually that works relatively well. I also try to use my time wisely – so on my commute I will read for work, or answer emails, meaning when I get home I can have more down time. I’m also lucky to work with lovely supportive people who make everything easier! The SYP has been a great experience and I know the 2019 chairs are going to do a brilliant job. I’d encourage anyone looking to get into publishing to join up! Congratulations on your move to Trapeze, what are you most looking forward to in your new role there as editorial director? Thank you! l miss my authors and colleagues at HarperCollins so much, but I’m looking forward to meeting a new set of authors and working on their books. I’m also so excited to start acquiring for Trapeze, and find some exciting new voices to bring to the list. Trapeze publish fiction and non-fiction, which will bring some more variety to my role as well, so I’m looking forward to that. What or who inspired you to first begin writing? I’ve always wanted to write in some capacity – I was a journalist for a brief while, but always had the urge to do something more creative, i.e. fictional! I started to take it more seriously when I was about 24, finishing my first manuscript and sending it out to agents etc. I did a great creative writing class when I was studying in America, and that prompted me to begin thinking about it as something I might actually do properly. The class in America was made up of a great bunch of students, all of whom had to give feedback on my work, and that was a big confident boost too. Tell me about your current writing projects. I’m currently writing my third book, due to be published in 2020. It’s another psychological thriller about Callum and Siobhan, a couple who go on holiday to the French Riviera, only to have their dream break interrupted by the police ringing the doorbell to arrest Callum on suspicion of a murder back in the UK. It’s called The Babysitter at the minute, but that will probably change! I am aiming to send it to my editor soon and will then start the editing process! Your second novel, The Girl Next Door, has just been published, how has the experience differed from that of your debut, The Doll House, both in the writing and the pre-publication activity? There’s been more of a build up to The Girl Next Door I think, as we sent our proofs quite early to ask for author quotes, so I’ve had more early readers and more time to worry! The Doll House was all quite a quick process in terms of the pre-publication activity, but then on the other side of that, the writing part of The Girl Next Door was quicker as there was more pressure. The Doll House was the first book I wrote, which got me my agent, so there isn’t any pressure from a publisher or anything at that stage. The first drafts of both books probably took me 4-6 months, and then the edits were another month or so after that. What advice do you have for authors who are concerned about so-called ‘Second Novel Syndrome’? Try to remind yourself that you’ve done it before and so you can do it again! I always remind myself of that, and tell myself that I’ll get to the finish line because I have done in the past. I was definitely nervous when book two hit the shelves, but quite a few readers have been in touch to say they’ve bought it because they liked the first one, so that’s lovely and a bit of a relief! The publishing industry is one where authors are constantly re-inventing themselves, so even if your second book doesn’t work, there could be a third, or a pen name, or a change of genre – you never know what will happen and the key thing is to keep positive and not give up! It’s hard when things feel out of your control, but try to trust your publisher and know that they will be doing their best for your book. What kinds of support would you recommend to writers looking to develop their craft/finish their first book and where can they find this support? There are some great books out there – On Writing by Stephen King, Save the Cat (all about plotting), and I liked Write a Bestseller by Jacq Burns. I also post lots of tips about writing and publishing on my website, www.phoebemorganauthor.com and there are lots of support forums for writers which can be very useful too. Twitter is another great place – sometimes agents will post tips about what they’re looking for in manuscripts, and tips for what to do when querying. I’d also recommend talking to writer friends if you can – join a writing group, and share your worries as other people can be hugely encouraging and make sure you get to that all important finish line in your book! There is lots of advice for writers about marketing themselves or their books via social media. Who did you turn to for advice on building your own author platform? Hmm I don’t think there was any one person in particular! My lovely friend Helena Sheffield who now works in audiobook marketing at PRH helped me understand about Facebook ads which was a really big help, as I find they can make quite a big difference. I also asked my colleagues at HarperCollins to help me with useful ideas for my blog posts, which have been quite popular – I suppose working in the publishing industry gives you a bit more of an insight into what authors can do for themselves and how that side of the marketing process works. I think it helps that I enjoy using social media and don’t really find it a chore. How did your knowledge of the market as a publisher influence the genre of your books? To a certain extent the insight I have from my job helped me identify with readers expectations but purely writing for the market can be a risky strategy. I’ve always loved reading crime novels and I decided to write the kind of novels I enjoy myself. Whilst crime will always be popular, the sustained trend of psychological thrillers over the last few years means it is a competitive genre and harder to stand out from the crowd, with publishers increasingly looking for high concepts and original plots. It’s an extremely enjoyable genre to write in and for now book three sits in the same vein. I am open to exploring other genres too though and who knows, maybe the next will be historical fiction. What do you wish you had known before you started writing? I wish I’d known that things would work out okay – I spent so long feeling sad that I might never be published, so I wish I could have saved myself all that angst. But that’s impossible of course, so all you can really do is keep going and not let rejection get you down – every single writer I know has been rejected in some capacity, and you have to become resilient, pick yourself up and keep going! To learn more about Phoebe or her books, follow the links below or if you are in Leeds and free today she will be taking part in a ‘Writing Romantic Fiction’ event, ticket link below. You can also sign up to my newsletter for more interviews of industry professionals in the coming months and news of my own debut novel, Pivotal, which is out in October 2019 with Hashtag Press! Thanks for following The Writers' Pod - you are on the list!